As an old Psion Organiser user, I’ve been looking for a good mobile calendar application for many years. You’ll hear Psion user’s wistfully describe their old organiser with the same level of dedication and reverence an Apple fan boy has over the output of Cupertino. The Psion devices contained a level of functionality that was years ahead of its time. Even today, you’d be hard pressed to find devices that come close to their levels of quality. But, for me, it’s the Psion’s Agenda application that I miss most. Superficially, it was just the native calendaring app but it had a level of sophistication that puts today’s offerings to shame. What was so great about Agenda? A thousand little things but, mostly, it was hugely customisable allowing each user to configure a version that suited them perfectly. 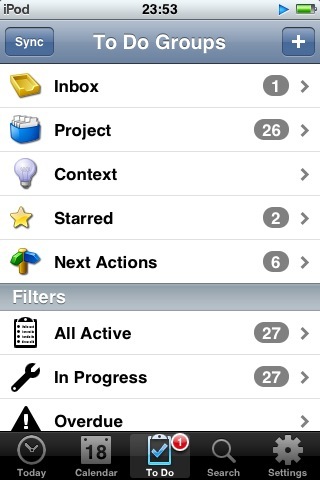 Sophisticated PIM (Personal Information Management) apps have been thin on the ground for the iPhone OS. I assume this is mostly down to a couple of baffling restrictions from Apple. The obvious one being that developers aren’t allowed access to the native Calendar app. This means the most basic function of such an application, being able to beep at the user when an item’s due, isn’t available to third party PIM applications. Now though, we have Pocket Informant from WebIS. Not only is it a sophisticated PIM combining Calendar and ToDo functionality but they have even come up with a couple of ways to alert you when it’s time to do something. Is it possible, at long last, someone has developed a PIM application that comes close to emulating Psion’s Agenda? Compared to the likes of the native iPhone calendar, Pocket Informant (PI) is a complex and potentially confusing application. Fortunately, there are quick start and reference manuals available on the developer’s website although it’s certainly possible to muddle through by exploring and experimenting with the application itself. Opening PI gives the user access to several views including Calendar, ToDo’s, Search and Settings. The ‘Today’ screen also shows current and upcoming items. The configuration options in PI are the most comprehensive I’ve seen of any iPhone app to date. I took this as a good sign as it meant I’d be more likely to tailor the app to my requirements rather than having to adapt to it. 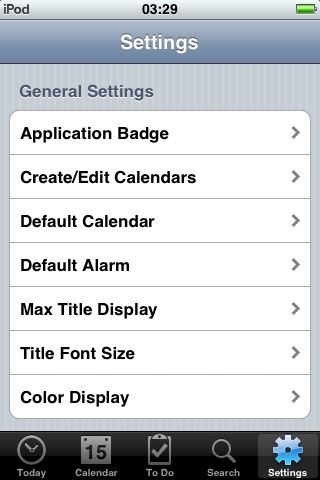 General options cover such things as what the application badge will show, default alarm settings, colours and font size. There are also specific options for the Calendar (working hours, week numbers etc), ToDo Mode (more on that later) and Sync options. Although you can use PI without syncing to an online service, one of the first things most people will probably want to do is set up the sync options between Google Calendar and Toodledo. I’m sure everyone’s fairly familiar with Google Calendar but in case you’re unaware, Toodledo is an online ToDo organiser website. Pocket Informant allows you to sync to both these free services giving a way to backup your valuable information and be able to access them from your desktop PC in one fell swoop. I have used Rainlendar for a long time to display Google calendar entries on my PC so I found it easy to setup and view my existing calendar entries within just a few minutes of using PI. I had also previously setup a Toodledo account and found that equally straightforward to connect to. Syncing to Google was a surprisingly smooth experience. Once I’d added my username and password, PI connected, found all my calendars and that was that. This is in contrast to my experience adding Google Calendars to the desktop app, Rainlendar. That is a convoluted case of my manually finding and copying the correct ical string for each calendar into Rainlendar. With PI, it was all done automatically! Not only were my ‘normal’ calendars found but the public ones I subscribe to including one for UK bank holidays and another showing the Formula One races. Call me picky but I was a little disappointed not to also see a year planner view. A very similar app provides this so it’s clearly possible. Entries can be displayed in different colours depending which calendar they belong to so, for example, private entries can be distinguished from work related ones. The choice of colours seems very limited and rather muted to me and I’d prefer the option to select any colour I want. It would also be nice to be able to easily choose which calendars are displayed. You can select which ones to sync in the settings but it would be handy to have separate display options. I can imagine scenarios where you’d want to de-clutter your screen by temporarily turning off certain superfluous calendars. You’d still want to sync them so they were available but sometimes not display them. Changing days, weeks and months is easily achieved with a swipe of the finger while you can always return to ‘Today’ by pressing the dedicated button on the top, left of the screen. A feature I didn’t realise existed until I looked through the manual was a way to go to a specific date. Tapping the date display near the top of the screen (not available on the ‘List’ view) brings up a picker where you can specify a day to jump to. There’s a lot of detail to be found in the Calendar section of the app. For example, in the Month view, A thin horizontal line helps to show how busy you are that day. An entry above the line is a morning appointment (midnight on the left and noon on the right) with it’s thickness showing how long it is while items below the line shows afternoon and evening events (from noon to the following midnight). The strongest sense of déjà vu comes when setting up a repeating entry. With most calendaring apps, only the simplest of repeats can be created. In Psion’s Agenda, you could conjure up what seemed a limitless array of repeats and Pocket Informant appears to match it. For example, to setup entries for EastEnders I create two items. One is every Monday and Friday at 8:00pm and the second is for every Tuesday and Thursday at 7:30pm. To achieve the same result in most calendars (e.g. the native iPhone app) takes four separate entries. This may or may not seem significant to you but it’s another thing I miss from my Psion days and I’m very pleased to see it return in PI. There are several additions I’d like to see for calendar entries. One is the ability to only show the next occurrence of a repeating item. This was possible in Agenda which allowed you to set it separately for each entry. The second small but significant addition I’d like would be to display ‘ages’ in annual events. So, for someone’s birthday it would say ’30 years’ or whatever since the start date. This is useful for Birthdays and anniversaries but also for other annual items too. I’d also like to be able to mark an entry ‘tentative’ so it appears greyed out while I’m waiting for confirmation. All nice little touches that Psion’s Agenda offered years ago and I’ve been missing ever since. So, given that Apple doesn’t (currently) allow developers to use the native calendar alarm, how does Pocket Informant prompt you when an item is due? Well, it doesn’t. What it does do, given that you can sync with Google Calendar, is allow you to use Google’s various alerts. So, you’re able to set it up so Google sends you a text message (or email) to your phone. This isn’t an ideal solution but it’s better than nothing. Let’s hope that Apple announces a few more goodies in June including the ability for developers to directly access the native Calendar and create their own alerts. I should also note that the documentation of PI suggests ways to sync the iPhone’s native calendar with Google (and so get native alarms for your calendar entries). This baffles me as it’s my understanding this won’t be possible until OS 3.0 comes out. But perhaps it’s because I don’t use a Mac or Outlook that I’m unable to do this. In any case, I wasn’t able to test it. Something that’s unique to PI, in my experience at least, is the ability to swap between two different ToDo modes. The first is the familiar GTD (Getting Things Done) method while the second is the less well known (to me anyway) ‘Franklin Covey’. The obvious difference here is the reduced number of Groups for Franklin Covey. I don’t profess to be an expert on either of these methods (I prefer my own) so I’ll simply report that Pocket Informant does what seems to be an excellent job of making the GTD method as absurdly complex and time consuming as it normally seems to me. I assume that Mr Covey will be equally pleased at the way his techniques have been implemented too. In short, if you’re a fan of either of these systems I’m sure you’ll be delighted with their presence here. You can’t specify a time for a ToDo item, only a date. I guess the developers would argue that if an item requires a specific time then it would become a calendar entry but I’d still like the option to specify a time for a ToDo. Oddly though, if you give a ToDo item a date, you are also able to add an alarm. The manual suggests this is currently a dummy field awaiting future work. One puzzling thing that I can’t for the life of me figure out is how PI decides what ToDo items are ‘Next Actions’. Items with no due dates or even priority levels are listed as ‘next’ while others with the same lack of dates and priorities are not. I’ll assume this is down to my lack of understanding of the ins and outs of GTD rather than a peculiarity of PI. The whole Pocket Informant experience is largely a smooth and trouble free one. Apart from a handful of crashes back to the home screen, the only bug I’ve noticed while using it is that sometimes the notes text doesn’t appear when I edit an entry. Tapping it brings the text back to life though. After using PI for a number of days now, I still don’t feel I’ve explored all it’s possibilities. The ToDo section, in particular still holds much mystery for me but that’s more due to my aversion to the GTD method than a fault of PI. Such sophistication and depth might amount to a criticism on most iPhone applications but for a PIM app, I find it oddly reassuring. It’s more likely that I’ll be able to find a way to do something and not get scuppered by the restrictions of a more simplistic application. Is it as good as Psion’s Agenda? No it isn’t. Is it a great deal better than the native Calendar app? Yes it is. Will it make me change my primary organiser from an aging Nokia to an iPhone? Not quite yet (there are other apps and functionality that the iPhone still needs to address – fingers crossed for June) but assuming Apple will soon allow access to the native alerts, I no longer have great concerns about the lack of PIM functionality. I get the impression from the developer’s website that they are actively developing for PI and intend to add more features. This is very encouraging and I look forward to watching PIs already rich feature set expand. At the risk of droning on, I would suggest WebIS look at the Psion Agenda if they ever start to run out of ideas. One last thought. While looking into Pocket Informant, I stumbled on a very similar app called ‘SaiSuke’. Although I haven’t spent anywhere near as much time playing with it as I have PI, it does seem to offer strikingly similar functionality (minus the ToDo’s but plus a year view) at a slightly cheaper price so anyone interested in PI might also like to check it out. Luckily, they both offer free versions to try before taking the plunge. A superb and thorough review, thanks Andy. You can sync your iPhone calendar with Google using Google Mobile Sync (an Exchange implementation). I think the killer for me is that it doesn’t use the iPhone’s native calendar database. Apple really should open this up – I don’t want to have to use sync workarounds in order to get alarms, for example. The iPhone is a crippled p.o.s. without background apps. Mobile Observer: To be perfectly clear about this ‘background’ apps issue. Not all applications are crippled because they cannot run as a background task. In fact, the majority of iPhone applications perform their intended task just fine without it. Your sweeping statement in regard to the condition of the current iPhone is inaccurate at best. Re syncing with iCal etc, yes it works, albeit via Google. There are several options as to how but I’ve PI as my main PIM, syncing to Google, then to iCal via SpanningSync to iCal. After that MobileMe takes over to push changes to my iPhone and Outlook on a couple of other PCs. Convoluted? You bet. But it works, allows multiple calendars on multiple machines to stay in sync and, interestingly, allowed my iPhone to ping up calendar alarms. Sorted! V1.2 of PI has a lot more changes planned and the deb team are also working on direct Exchange sync plus a few other options. Will be good watching this app mature (something the original Agenda had to do too). Good news.This will be great.